Pioneering distillery installs Flowcrete UK flooring .. 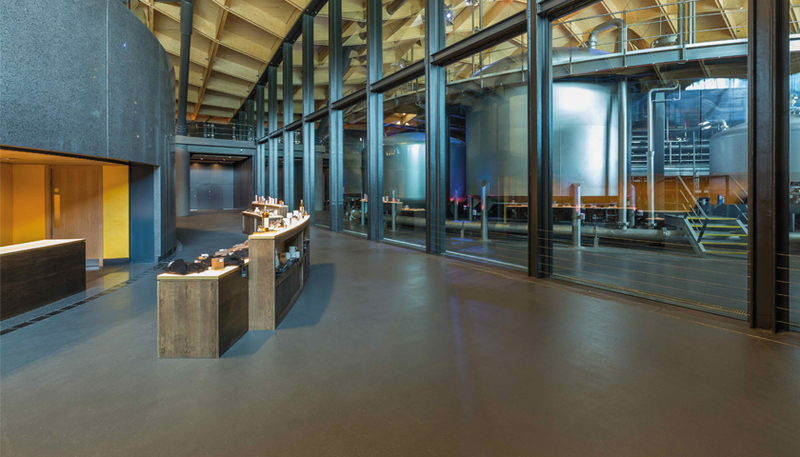 The new distillery for luxury whisky brand The Macallan has installed a variety of Flowcrete UK floors. To ensure that the flooring would maintain a functional, visually attractive finish, 5,570m2 of the polyurethane system Flowfresh HF LT was applied. This robust, chemical resistant system would be able to withstand the onsite conditions and provide additional benefits such as easy cleanability, slip resistance and an in-built antibacterial agent. A sleek grey colour was chosen to match the production area’s industrial aesthetic and thanks to the easy applicability of the system, the floor was completed on schedule and to The Macallan’s exacting standards. Flowcrete’s screeds and decorative finishes were also applied across the site’s visitor centre and distillery tour. To find out more about Flowcrete UK flooring, please click here.